Both acupuncture and acupressure are forms of alternative medicine that do not involve surgeries, medication or extensive doctor visits. Acupuncture and acupressure both have their roots in Chinese medicine. Principles of Chinese medicine center around the idea that the body is a small part of the universe. Disease is viewed as an imbalance and Chinese practitioners throughout history have developed an intricate system of how organs relate to the physical and mental systems of the human condition. Acupuncture and acupressure are both very different. Acupressure is the art of using needles to pinpoint pressure points and acupressure is healing through finger pressure massage techniques. A Chinese practitioner would have to examine the patient according to their tradition. A thorough diagnosis of the patient's condition would need to be derived so that they can better choose which type of healing your body needs. Acupuncture must be performed by an expert in the field of traditional Chinese medicine. It is more precise than acupressure because it deals with specific pressure points related to nerves in the body. Acupuncture has been known to treat diseases that have been known to resist most other treatments. Acupressure is an ancient Chinese massage known as Shiatsu and can be learned from a handbook rather than someone that has studied Chinese medicine. There are no needles involved with acupressure and it is simply the art of the human healing touch. 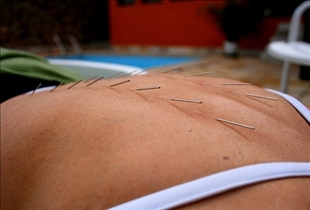 Acupuncture is known to be an alternative healing practice. How exactly is unknown, but this form of medicine has been widely used in successfully treating pains and complications related to: cancer, carpal tunnel syndrome, fibromyalgia, labor, injuries related to the neck, shoulder, knee, or elbow, osteoarthritis and rheumatoid arthritis. muscle and tissue relaxation, management and reduction of stress, releasing toxins from the body, disease prevention related to said toxins, increasing flexibility, improving blood circulation reducing blood pressure and reducing mental anxieties. Acupuncture uses very thin, very flexible needles to hit pressure points to relieve unbalances in the body causing the disease. The needles are very thin, very flexible and are sterilized before each use. The needles are disposed of properly after each one is removed from the body. Acupressure, however, uses the human touch on pressure points of the body to relieve stresses. Although both forms of ancient Chinese medicine deal with alternative ways to heal infections and diseases that reject modern medicines, acupuncture and acupressure are both very different. Acupuncture is known to treat certain cancers neck back and joint injuries and even fibromyalgia. Which therapy are you more interested in? The info you have here is very easily understood. Although I am not a professional, I am always interested in other forms of pain management and all around health options. I am very interested in this procedure. Thanks.